This is one of the more complex "fields" in patent searching. AcclaimIP uses multiple assignee name fields to keep everything straight, and to give you the power you need to efficiently search assignee names. This article is designed to give you a quick start. More details on Assignee Name searching can be found in our Advanced Syntax section. Patents change hands through various means, such as through the acquisition of a company or the purchase of individual patents. Therefore, the current assignee may not be the same as it appears on the patent. For the purposes of consistency we use the term Original Assignee (i.e., the Assignee (Original) column) which is often called the Applicant. These are the same. When an application is published or a patent is granted there is often (but not always) an assignee name printed on the document. This is the Original Assignee. For a patent to have a different Current Assignee listed in AcclaimIP, two conditions must be met. It must have changed hands (usually through some kind of civil contract). It must be registered with the patent office. There have been countless cases where an acquisition occurs but only the involved parties are aware of the transaction. In other words, keep in mind that there may be cases where the current assignees listed by the various patent offices (and thus by AcclaimIP) are not the actual current assignees. Learn more about this query in our Advanced Syntax section. 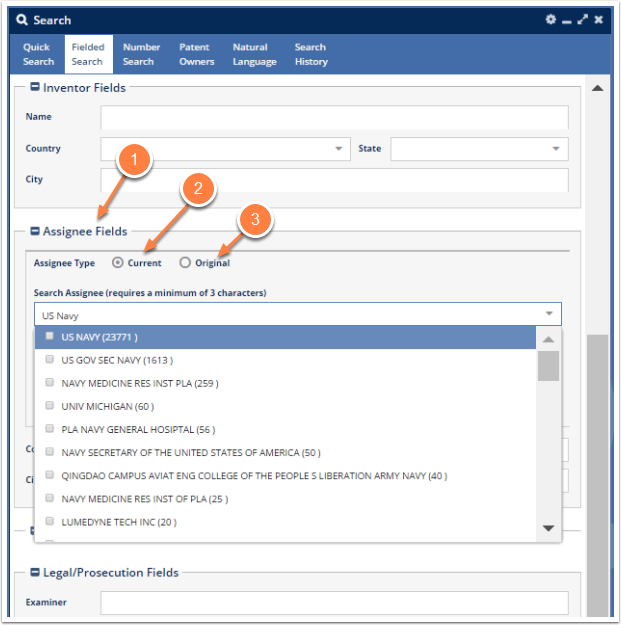 You can search for patents owned by a particular assignee using the Search>Fielded Search. The system uses suggestions and includes the facets (counts), but does require a minimum of 3 characters. Open up the Assignee Fields (1) field set. Select either Current (2) or Original (3) from the assignee radio buttons. Type the first few letters of the assignee name (here I am using the example "US Navy"). Click the Search button (under the facet list in this picture. After making your selection, you may have to click away from the window to close the facet list). Notice in this example there are other names that don't have the words "US Navy." These are co-assigned patents (patent with more than one assignee name listed). If you check both the "US NAVY" and "UNIV MICHIGAN" options, you'll find the top results are the patents co-assigned to both entities. When you search using Fielded Search you can only search the normalized version of the assignee name. AN_ORIG:Siemans (Siemens is misspelled here) --> Finds patents that were granted with this misspelling. 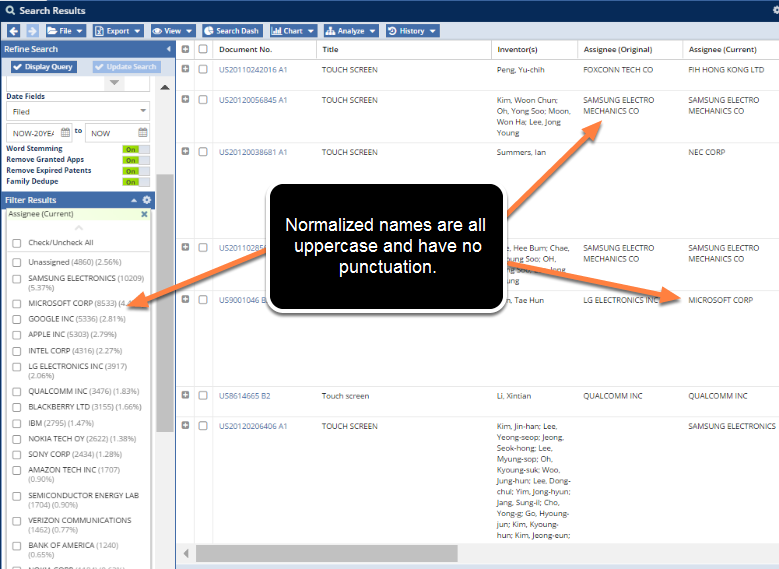 Assignee names are normalized in AcclaimIP. It is almost impossible to work with assignee name fields if they are not. For example, there are over a thousand different versions of "US NAVY" in our database, and this does NOT include differences in punctuation! You can tell if a name is normalized if you see it in ALL UPPER CASE LETTERS across the entire field and there is no punctuation in the name. Each week we normalize 100's of new assignee names. If you find a company that has not been normalized, or a new variant that crept into the mix, just let us know and we'll work to take care of it. Once you embrace our advanced search you probably won't go back. Search using Advanced Syntax right in the basic Search (1) window. Your query will be echoed in the Refine Search panel's Search field (2) where you can edit it and refine your search. 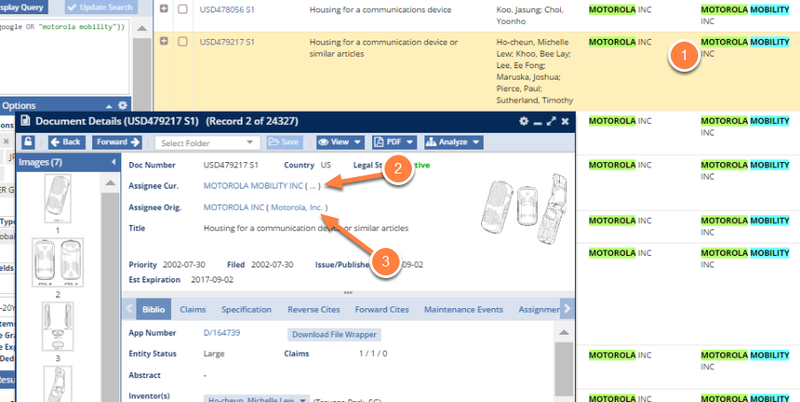 Start by committing to memory the following three field codes you can use to search assignee names. You can always see the original name as written on the patent by opening the document details window. There you can see the un-normalized version of both the original and current assignee name. Notice the normalized versions (1) of the name in the Search Results grid. This will match the fields in the Document Details window. It is inefficient to use un-normalized names in the grid, so they are always normalized. If you want to see the un-normalized name, in the Document Details window click on the ellipses (2) next to the normalized assignee name. In this example, I have already clicked the ellipses for the Assignee Original (3). Notice that "Motorola, Inc." is spelled out completely and with punctuation. This is how it is written on this patent. The normalized name has no punctuation. Click the names in either the Assignee Cur. or Assignee Orig. fields (either normalized or not) to search for instances of that version of the name in the respective field. Clicking the name will bring up a new search results window with the correct search in the Refine Search panel.